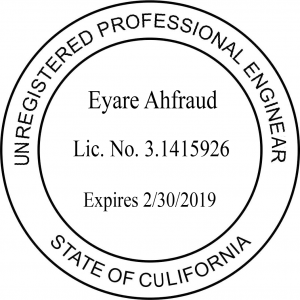 With the push to apply for as many cell sites as possible in as short a period as possible, and for the least cost, we’re observing an alarming new situation: the use of Professional Engineer seals and signatures copied onto wireless project plans and related safety documents, all without the knowledge–much less the permi ssion–of the professional engineer. This is an issue that appears to be happening nationally. Unfortunately, the use of what I’ll call “Stolen Stamps and Signatures” [“SSS”] also known as Stamp Fraud is also not much of a surprise. The industry pressure to get proposed wireless sites through the local government permitting process as quickly as possible for the fewest dollars seems to have incentivized some wireless industry members to engage in what is, in most states, a violation of law. Specifically, scanning PE stamps and signatures from one set of plans for a project location reviewed and approved by the PE, and than inserting the scanned seal and signature on multiple other project site plans. SSS endanger the public. 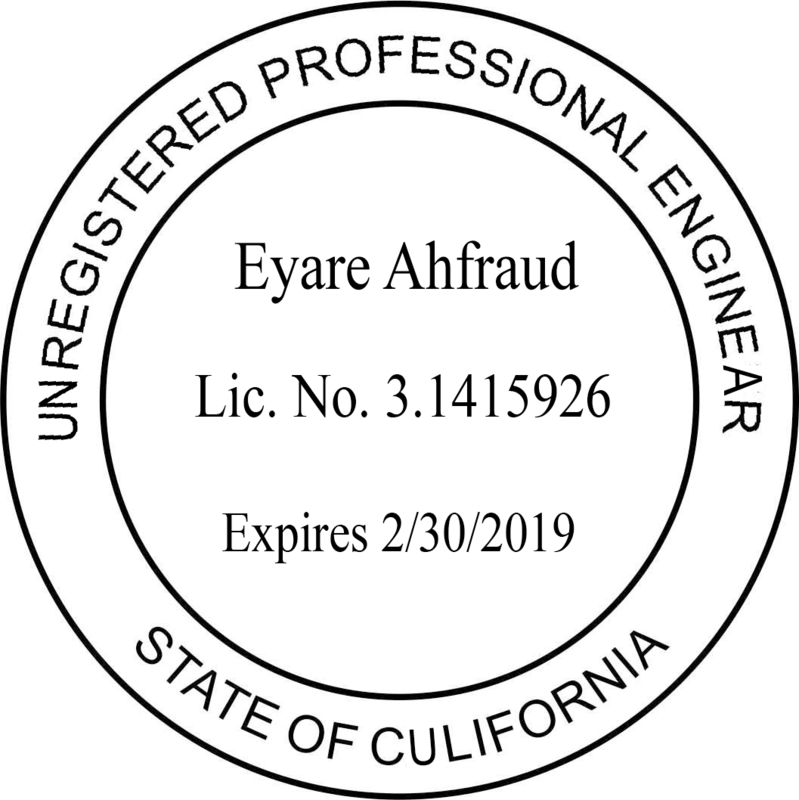 The public, and more directly the local governments that have police powers to protect the public, rely on the fact that an engineer’s PE seal and signature are an assurance of safety code compliance. SSS are a violation of law in most states. Most states have laws on the books that make the unauthorized use of a PE stamp an illegal act. Expect to see stamp fraud referrals to local law enforcement and state PE boards. Also expect to see planning companies shown to engage in stamp fraud to be disbarred from submitting additional wireless applications for a period of time or forever depending on who in the firm knew what and when. Disbarment of a firm or person by a government entity can require the disclosure of that fact when a locally-disbarred person or firm bids on state, federal, or military contracts. SSS costs a registered professional engineer income, and more importantly the loss of professional reputation. If SSS is discovered by a PE, that PE is placed in the unenviable position of having to decide whether to accept the theft as a cost of doing business with their large clients and eat that cost of the lost work or dropping a dime with the state PE Board. If the PE does eat it, however, the PE is likely endangering his or her own license by suborning the illegal use of the PE stamp. I suspect many state PE boards will not look favorably on that intentional head-in-the-sand approach. Moreover, some jurisdictions may also look at disbarring a particular PE as being unreliable to seal plans and safety documents for the intentional looking away. As above, disbarment at one level can carry through to other governments and agencies. SSS hurt the wireless providers. As the breadth of stamp fraud becomes clearer, expect that projects already approved that were submitted by now-known stamp thieves will be brought back for very close scrutiny. Projects already approved under false pretenses may be subject to revocation, or at least a costly new review. SSS is likely to change the local permitting process. I expect that as the breadth of this nauseous activity is determined with greater certainty, some or many jurisdictions will require that actual wet stamps and wet signatures be affixed to plans and other safety documents. This will be a change from the current practice, now questioned, of allowing facsimile stamps and seals to be placed on plans and safety documents. Our firm’s permitting team, working for many local governments, is coordinating our activities with local governments evaluating whether they have been unlawfully deceived by SSS/stamp fraud. This is an big issue to follow, and I’ll post about it as events unfold. Those are my opinions…what are yours? Let me know via a direct contact message by CLICKING HERE. Update: April 18, 2019. The Florida Board of Professional Engineers asked for and received my permission to reprint this post in its official newsletter, the FBPE Connection. This post, slighted edited by the FBPE, is reprinted in its April 2019 on-line news letter. 1 comment to Wireless Site Project Plans with Stolen PE Stamps? Thanks for bringing this up. Not only is this fraud a problem in our industry, but forged or altered safety certifications are appearing. A second look at credentials is increasingly necessary!